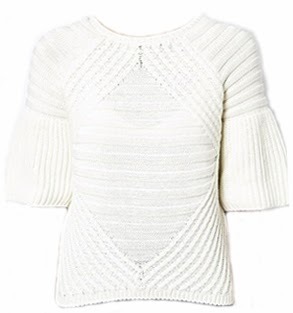 For me, this knit sweater would be as indispensable as my favorite white t-shirt. The flared sleeves make it even better. Love! If I wear a 4 in jcrew shall I order a 4 or 6? I remember the pink one in a previous post. It was sold out by the time I went to buy it. Any idea how this fits...or any River Island items for that matter? I wear a 4 in J. Crew and ordered a 6. I am from the UK and find that these reasonably priced items do run a bit smaller, though I know others may find differently. Hope that helps. River Island fits pretty TTS. I would size up if you're in between the smaller end of the size range. Yes, it's a good one! I always size up in River Island. I were a J.Crew 4, I'd order a size 6. Hope this helps! Merry, merry! This is a beautiful sweater. I love how interesting the sleeves make it. I might have to add this to my own wish list!